Do not start rumours by forwarding incorrect messages, says the guide. 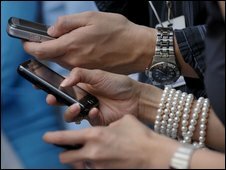 A code of ethics for the use of mobile phones has been launched by Egypt's official telecoms regulatory body. The 16-point guide includes advice about when to switch phones off and warns against annoying others with ringtones and loud conversations. Mobile phone technology is "considered one of the greatest technologies (to) emerge in the last few years to serve humanity," it says. But it should not be used to "annoy or tease" others, the guide continues. The code was prepared by the country's National Telecom Regulatory Authority and the Consumer Rights Protection Committee. "This Ethics Code aims to regulate the users' behaviours on using mobile phones especially with the increasing and intense problems and irresponsible behaviour of some users of mobile technology," reads the introduction. Don't annoy others with your loud conversations in case you have a mobile phone loud speaker. Moreover, this offends the person you are talking to (on the mobile) as he does not know that others are hearing his conversation. Choose a non-annoying ringtone. Ringtones aim mainly to make the mobile user know that he has got a call. On receiving a text message, verify the information mentioned in it before circulating it. Putting pictures or videos of somebody on the internet without their consent is punishable by law, warns the guide. Mobile phones should never be used to "violate others' privacy". It also says that mobile phone users will face legal action for sending text messages that include "inappropriate words or indecent photos". Users are told to be patient with wrong numbers and not to answer calls from unknown sources. "Use your mobile phone to report something or receive important information," instructs the code. Calling people when they are resting or sleeping is also to be avoided. "There is always going to be anti-social behaviour, with or without mobiles," said Doctor Emma Short, a psychologist at the University of Bedfordshire who specialises in mobile phone use. "Using a mobile phone and being a good citizen means being mindful about the message you give out when you pick up the phone."